The client is severely disabled, virtually blind and confined to a wheelchair, yet determined to live as independently and sustainably as possible. The secluded site was beside a small river in the hamlet of Evanton, and the building was positioned at the northern edge of the plot, to maximise the solar penetration. The two bedroom house was fully glazed to the south, with generously proportioned sliding doors to creating an enfilade from gable to gable on the garden side. 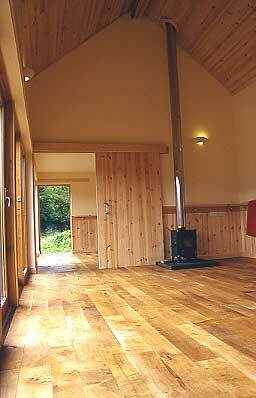 The construction was a timber kit with larch cladding obtained from a sawmill a mile down the road. The house was highly insulated with cellulose insulation, and had underfloor heating served by a ground source heat pump supplemented with a wood burning stove. (This may not sound very suitable for a blind and disabled client, but has been very successful and much appreciated.) 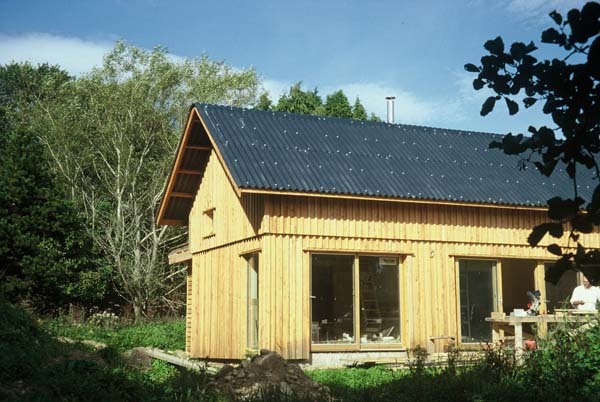 The pitched roof was clad in corrugated mineral fibre sheeting, and the bathroom and kitchen to the north had a turf roof. 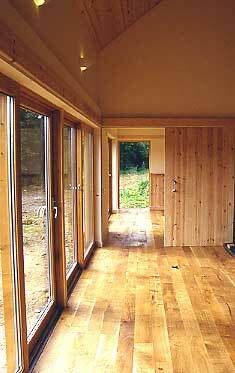 The contractor was Neil Sutherland who produced a well finished, sweet smelling and comfortable building from local sources.